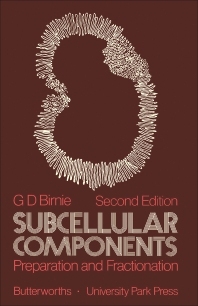 Subcellular Components: Preparation and Fractionation talks about cells and particles' components, including their preparation and fractionation. The book includes theories and answers to questions that are relevant to the study. The first chapter of the book details various facts about homogenization of mammalian cells. This chapter presents the results of studies on solid tissues and single-cell suspensions; the author then offers his conclusion of the study. The next two chapters highlight the methods on isolating nuclei, including the guides for standard assessment and the procedure of isolation, along with analysis of nuclei biochemical properties. The main topics in Chapter 4 are mitochondria from animal tissues and yeasts; this chapter also discusses the preparation for a rat-liver, blowfly flight-muscle, yeast, and brain mitochondria. The chapter that follows widely talks about lysosomes, including its historical background, centrifugal method, and related topics. In the next several chapters, the topics covered include purification, isolation, preparation, and separation of cells including plasma-membrane, polysomes, ribosomes, microsomes, and microvilli. The book serves as a great reference for undergraduates and postgraduates in the field, as it contains a thorough discussion of various relevant studies.